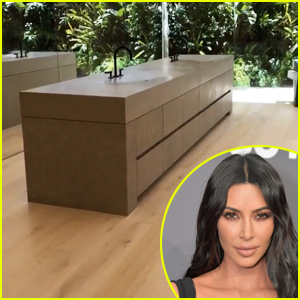 Kevin McHale is one star you won’t be seeing at the 2018 Coachella Music Festival, but he has let us know where he is instead! We bet Kevin will at least be tuning in to the live stream tonight to watch Beyonce, one of his favorite performers, hit the stage. Kevin even references the “Formation” lyric “My daddy Alabama, momma Louisiana” in his Instagram bio. One month ago, Kevin posted a photo of him holding hands with someone and fans believe it’s Austin‘s hand in the pic. The two actors appeared together in the mini-series When We Rise. Kevin McHale and Austin McKenzie pose for a photo together while donating their time at the Los Angeles Mission’s Easter Celebration on Friday (March 30) in Los Angeles. The guys helped serve an early Easter meal to people in need. Kevin, 29, and Austin, 24, worked together in the ABC mini-series When We Rise and they have remained close ever since. Austin made his Broadway debut in the revival of the musical Spring Awakening a couple years ago and he can be seen in the indie film Speech & Debate. Kevin is best known for his work on Glee. Darren Criss Joins 'Speech & Debate' Cast at NYC Premiere! Darren Criss hits the red carpet at the premiere of the new indie film Speech and Debate on Sunday night (April 2) at the American Airlines Theatre in New York City. The 30-year-old former Glee actor appears as himself in the movie and he joined stars Sarah Steele, Austin McKenzie, and Liam James at the event. The film follows the unlikely teen trio, frustrated by parents, teachers and their school, set out to make their voices heard as they revive a defunct speech and debate club and take on the world. Make sure to watch an exclusive clip that we premiered last week! Oscar-winning screenwriter Dustin Lance Black has written every episode of the upcoming event series When We Rise in hopes of saving some lives! “I think this is one of the first times a major, public network is pushing out stories the way it ought to get pushed out there,” the 42-year-old director and producer expressed while attending a special screening for When We Rise at the Castro Theatre on Monday (February 20) in San Francisco, Calif.
“It is brave and bold and life-saving because there are a lot of young people who feel alone tonight and two weeks from now, they won’t,” Dustin added (via ABC News). 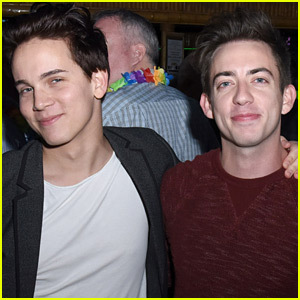 Also in attendance at the screening was Dustin‘s fiance Tom Daley, stars of the series Rachel Griffiths and Austin McKenzie, as well as Charlie Carver and Kevin McHale. When We Rise chronicles the personal and political struggles, set-backs and triumphs of a diverse family of LGBT men and women who helped pioneer one of the last legs of the U.S. Civil Rights movement from its turbulent infancy in the 20th century to the once unfathomable successes of today. The period piece tells the history of the gay rights movement, starting with the Stonewall Riots in 1969 – Watch the trailer below! 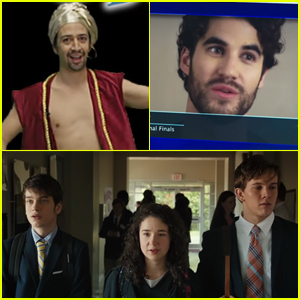 Lin-Manuel Miranda & Darren Criss Make Cameos in 'Speech & Debate' Trailer - Watch Now! Speech and Debate is set to feature some famous cameos! The upcoming flick is based on the play of the same name by Stephen Karam and stars Sarah Steele, Austin McKenzie, and Liam James. The trailer for Speech and Debate even features hilarious appearances from Lin-Manuel Miranda and Darren Criss! Oscar-winning screenwriter Dustin Lance Black has written every episode of the upcoming event series When We Rise for ABC and the first trailer has been released! 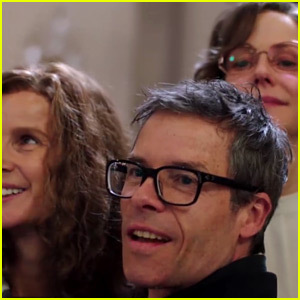 The seven-episode mini-series stars Guy Pearce, Mary-Louise Parker, Rachel Griffiths, Whoopi Goldberg, Rosie O’Donnell, and more. It is set to premiere in February. When We Rise chronicles the personal and political struggles, set-backs and triumphs of a diverse family of LGBT men and women who helped pioneer one of the last legs of the U.S. Civil Rights movement from its turbulent infancy in the 20th century to the once unfathomable successes of today. The period piece tells the history of the gay rights movement, starting with the Stonewall Riots in 1969. Also in the cast are Carrie Preston, Michael Kenneth Williams, Jonathan Majors, and young Broadway talent Emily Skeggs and Austin McKenzie. “After 3.5 years of hard work by so many dedicated souls, I’m thrilled to share the first trailer for #WhenWeRise,” Dustin wrote on Facebook.